Despite some attempts to include credit cards usage in everyday life, especially for foreign travelers, cash is the most used and safest payment method in Japan. Even the super famous Suica and other IC cards for payments have to be charged with bills and coins ; it is therefore impossible to imagine traveling or living in the country without cash in your pocket. 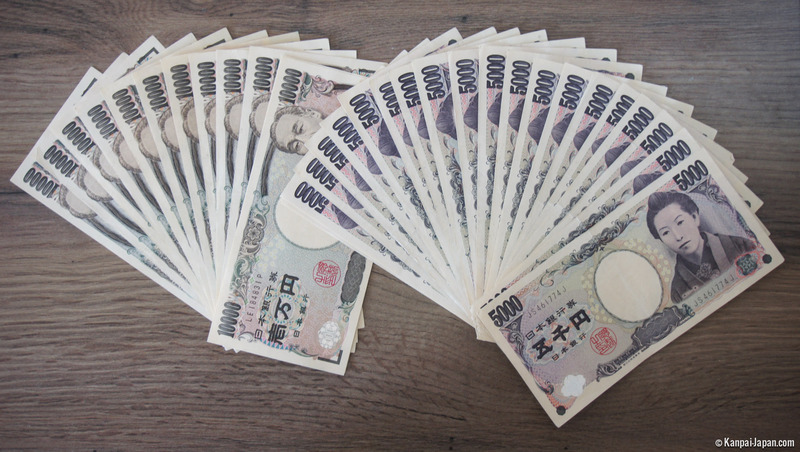 Formerly known as 両 ryo, Yen is the Japanese official money, also known by its symbol ¥. They are minted by the government. The smallest value is also the smallest in its measures: made of aluminum, the coin has a diameter of 20 millimeters and weighs about 1 small gram. It has kept it light gray color and the same ornaments since its inauguration in 1955. At that time, its design was supposed to represent Japan’s progress. While being more and more used in the everyday life, because of the VAT since 1989 (and its recent increase) which generates not rounded prices, this coin will be the one mostly staying in your purse at the end of your travel. Do not hesitate to use it when you have the occasion, for small purchases in a konbini for example. Quick anecdote: it is being said in Japan that the 1¥ coin costs 3¥ to produce! Made of zinc and nickel, we can see the design of a branch of rice, key food of the Japanese cooking. Its shape being pierced in the middle reminds of very old coins, but this version dates back from 1949. In Japanese, goen (5¥) is homophone to 御縁 "destiny, good fortune". Therefore, it is being said that it brings luck. This coin can be recognized by its bronze color, and proudly carries the main building of Byodo-in temple in Uji. Made of copper and nickel, this coin did not always have a hole in the middle. 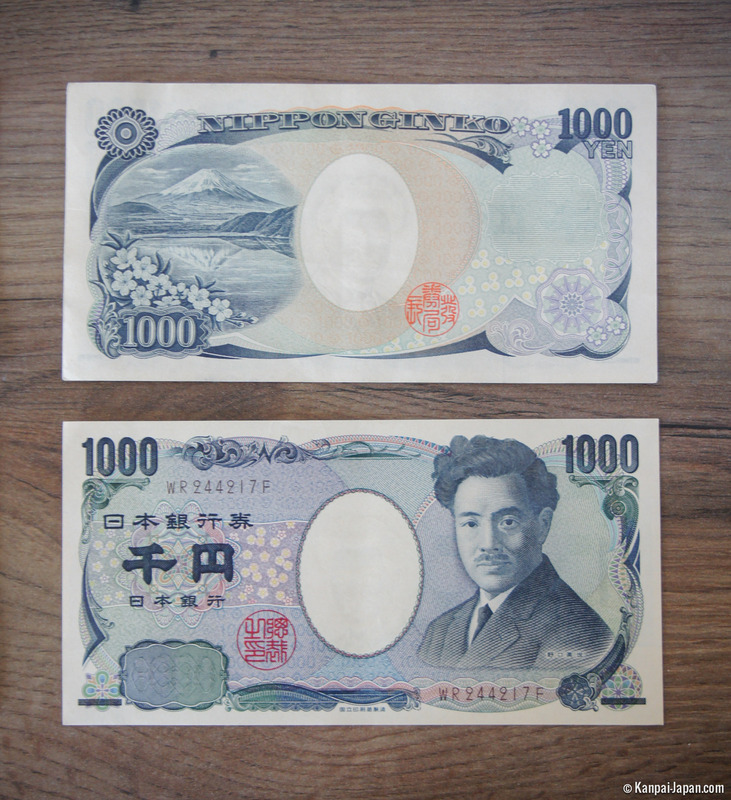 It obtained it in 1959, not to be confused with the 100¥ which shares a lot of common aspects, starting by their color. On the back, we can see a branch of chrysanthemum, which represents the imperial power in Japan. Inaugurated on December 11th, 1957, it is the closest equivalent of the 1€ coin or 1$ bill, meaning it's the cornerstone of the Japanese money system. On its back, another Japanese symbol: the sakura flower. Attention: contrary to what one can think, the 100¥ coin is not enough to purchase an item in the 100-Yen shop, as this price is not VAT included. The strongest value is also the most recent one (at the end of the 20th century). With its 2 millimeters of thickness and its 7 grams, it is not a discrete one. Lots of lunches cost 500¥, which allows to eat lunch with only one coin. 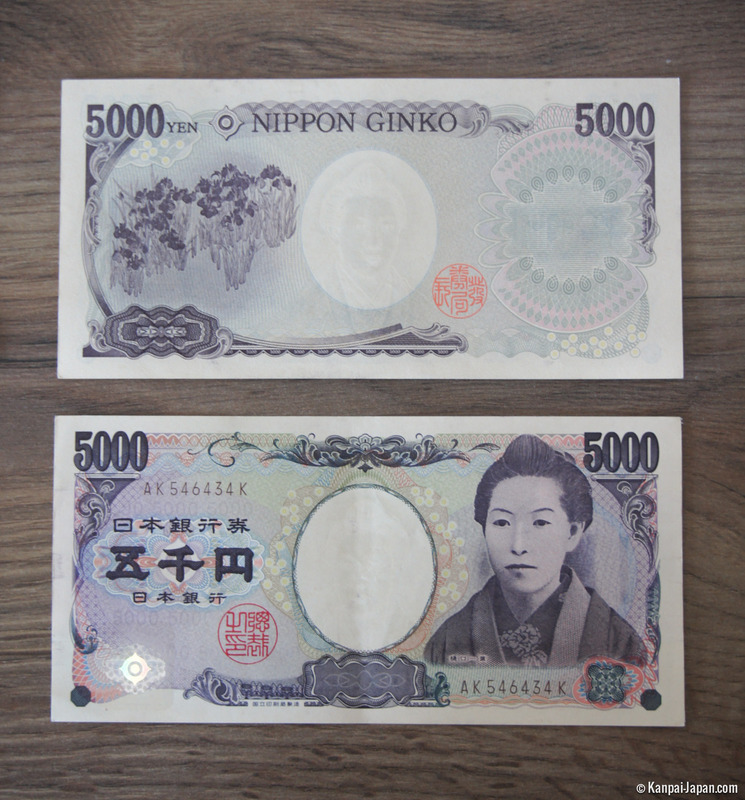 In the past, there was a 500¥ bill but it disappeared a long time ago from the circulation. The nobleman Iwakura Tomomi is fount on it, adviser at the imperial court during the 19th century, notably known to have unified the empire and the shogunate as well as being opposed to the opening of Japan towards the rest of the world. The Japan Ministry of Finance will mint 3 coins in limited edition to commemorate Tokyo 2020 Olympic Games. They all share the same height of 76 millimeters but their length varies from 15 to 16 centimeters. 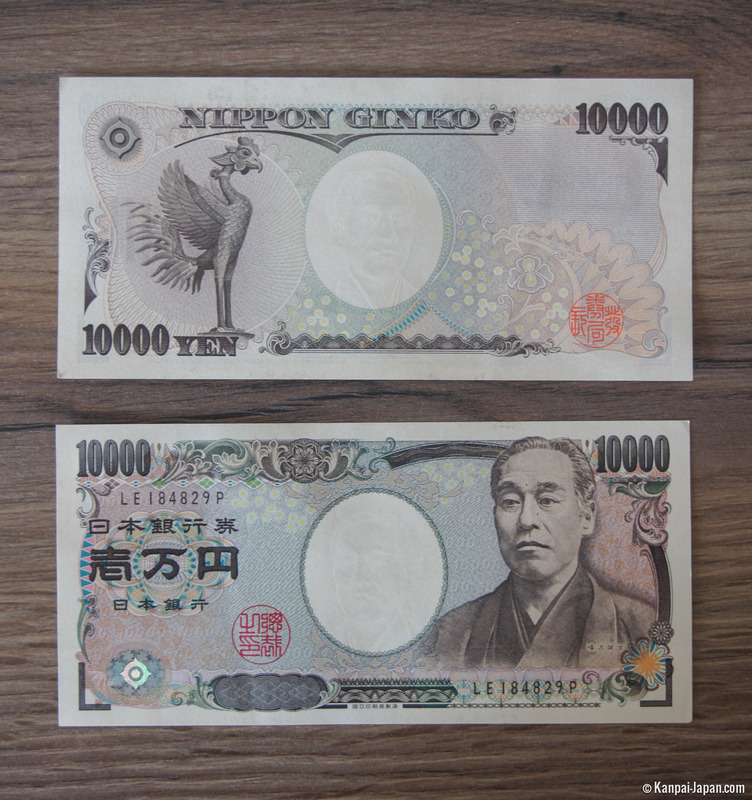 The bills are issued by the central bank of Japan: Nippon Ginko. 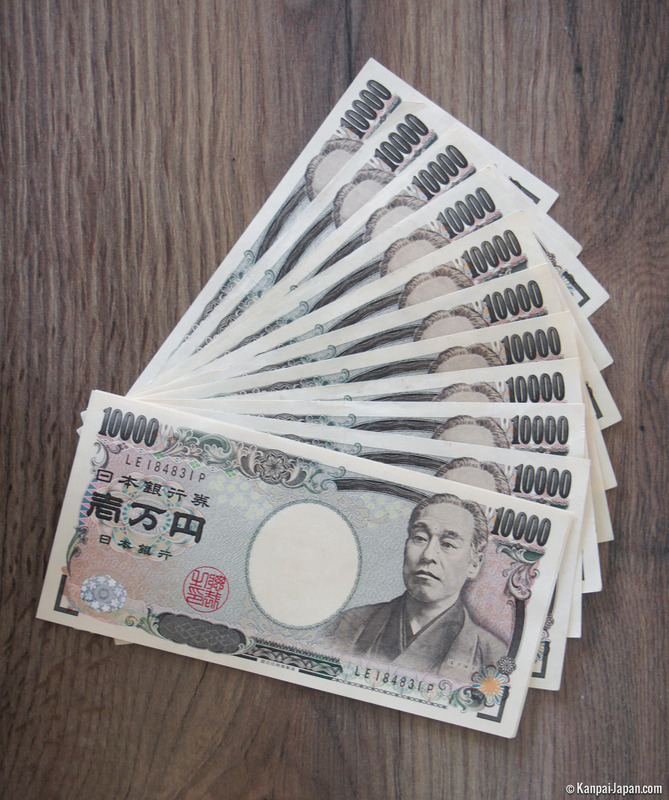 It is certainly the most used bill in the purse of travelers in Japan. Its front presents the bacteriologist Hideyo Noguchi, famous to have discovered in 1911 the pathogen agent of the syphilis. On the back, famous images of Japan: Mount Fuji and cherry tree branches. This one happens to be the rarest, and for a reason: it stopped being produced since 2004. Moreover, it is not accepted in the vending machines. If by chance you happen to have one in your hands, keep it for your collection! Are represented, on one side the great Shureimon gate of Shuri in Okinawa and on the other, the court lady Murasaki Shikibu (10-11th century) and its famous novel The Tale of Genji. Behind its purple color you can discover two important names from the cultural history of Japan: Ichiyo Higuchi, considered as one of the first woman writers of the archipelago, and Ogata Korin, painter from Kyoto during Edo period, notably famous for his iris flowers, in this case the Kakitsubata-zu. Strongest value of the range, it shows since 1984 (reviewed in 2004) Fukuzawa Yukichi, intellectual of the Meiji period (19th century) and founder of Keio University. On the back, once again, a small statue of the phoenix from Bodyo-in temple's roof is represented. Ideal to pay the restaurant bill with friends/family, this bill is not so appreciated for small purchases because it requires a lot of small money in return, even if the seller will not show it to you. It is also the one you will mostly find in the currency exchange offices or in ATMs.